As the Obama administration moves toward completion of its ocean policy and planning blueprint, it’s becoming clear that the new kid on the block has grown into a dynamic young adult, ready to change the shape of ocean planning forever. Marine Spatial Planning (MSP) is taking a central role in the ocean task force’s work, and a recent symposium on MSP put together by NOAA’s Office of National Marine Sanctuaries offers a great introduction to the power of this approach. At its root is a simple idea, one we’re very familiar with after decades of zoning on land: let’s identify which areas offer the best opportunities for fulfilling each of our goals and needs in the sea, then use this information to focus each activity in areas where it will have the least cumulative impact on other priorities. Where are the regions most important for each species’ reproduction and feeding? Which areas have the best possibilities for wind energy? Where is shipping concentrated? How about recreational diving and near-shore boating? Navy training, underwater cables, key fishing grounds, and all other ocean uses are mapped into layers, from which we can make informed choices about where to focus each activity. Steven Murawski, Ecosystem Goal Team Leader for NOAA, offered a good overview of the science and planning elements that are being developed. Of special note is the inter-relation between MSP and new “Integrated Ecosystem Assessments,” which can provide much of the data needed to make good choices about how to use each area in MSP. Charlie Wahl of NOAA’s Marine Protected Areas Center introduced work developing a regional Ocean Uses Atlas for the west coast. Drawing on both scientific data and workshops at which key stakeholders (fishermen, kayakers, etc.) identify areas most important to them, the Ocean Uses Atlas culminate in maps showing, for example, how many other uses co-exist in areas where offshore wind farms may be built. The maps show that in some places, up to 17 other uses are trying to co-exist, while there are other places where only one or two other uses target the same area. When combined with wind resources data, wind farms can be targeted for the “holes” in the conflicting uses maps. 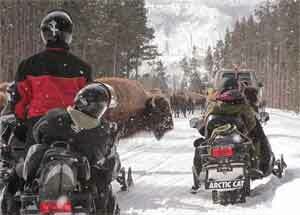 As surely as winter follows autumn, Yellowstone National Park’s annual rite of tussling over snowmobile use has arrived just on time. After issuing a proposed 2-year winter use plan in September, and opening its arms to receive a round of public comments that likely mimic those received during the previous three attempts to settle this issue, the Park Service issued its interim rule on Friday, and on Monday, the State of Wyoming challenged it in federal court. With the winter season due to open in December, the now-unsettled situation is a familiar one. Improving the situation over previous years, however, Wyoming says it will not ask for an injunction to stop implementation of the new rule on the eve of the winter season, since outfitters are basically prepared for the lower numbers already. This time, the number under dispute is 318. That’s how many snowmobiles the new interim rule calls for; the last full NPS EIS recommended the same in 2008, though the Bush administration intervened and proposed instead that 540 be allowed. That, of course, spurred environmental groups to challenge the rule, which was overturned by a DC federal court. The NPS is headed back to the drawing board, and is planning a 2-year EIS process to try to resolve the issue, with the current proposed interim rule to be in place for the next two winters. Wyoming has called for NPS to revert instead to a 2004 winter use rule that allowed 720 machines per day; this rule began a tradition of spurring dueling rulings from federal courts in DC and Wyoming—the DC court saying that the number is too high to fit with NPS science findings, and WY court saying that the limits are too low—which the 2008 EIS was trying to resolve. Yikes! Rather than try to recount the whole sordid mess up to now, if you’re a glutton for punishment I invite you to peruse the AEIews archives or Special Report on the issue. For local news coverage of this round in the mother of all snowball fights, see this article in the Jackson Hole Daily, and this commentary by a local environmental group urging snowmobile advocates to turn their sights toward National Forest lands around Yellowstone where, in fact, winter snowmobile enthusiasts spend the vast majority of their motor-sled time. This AP article provides a concise history, up to this September when Federal Judge Clarence Brimmer decided that he had no standing to intervene to derail the new interim rule and impose the 2004 limit of 720 snowmobiles (in a legal thread separate from this week’s challenge, Wyoming has asked the regional Federal Appeals court to allow or urge Brimmer to address this claim UPDATE 11/24: The Appeals Court denied the appeal, agreeing with Brimmer that the original issue is moot now that NPS has issued its temporary plan). In the meantime, let’s all pray for snow and some modicum of sanity to quiet this decade-long dispute in the next couple of years! 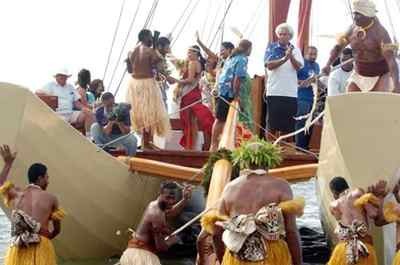 The newly-formed Fiji Islands Voyager Society was christened at the start of the South Pacific Pageant this week, with the dawn launch of the canoe Uto Ni Yalo (Heart of Souls). In June of next year, a flotilla of canoes will sail from Fiji to Hawaii to advocate the protection of our ocean environment and rekindle traditional voyaging, sailing and navigational skills. Representing the Pacific Voyaging movement, Rawiri Patekere from New Zealand, said people of the Pacific had been the innocent victims of ocean noise pollution for years. “And the time has come for the Pacific to unite, stand firm while they voice their concerns,” Mr Patekere said. “The sea has been crying for years and it is time to answer that call for help.” Recalling the words of his grandfather, he said, “when you paddle your canoe, paddle quietly.” Director Letila Mitchell says the Wasawasa Dawn Festival celebrates Pacific Culture, and that “the Ocean Noise project will raise awareness to help stop the increase in noise pollution being brought about through shipping.” Read more at these three Fiji news outlets. Just a quick note to say that I did the first major update to AEI’s Special Report on wind farm noise today. I added several key new pieces that will be familiar to regular readers of this blog. The report aims for AEI’s typical sweet spot of providing a comprehensive yet concise overview of all the key issues, presented in a balanced way, with links to source material and advocates on all sides of the issue. The report can be viewed online here, or downloaded as a 33-page pdf here. View more documents from Acoustic Ecology Institute. A test run of one of the most promising new acoustic monitoring technologies is underway in Hawaiian waters: a six-foot long autonomous glider has been outfitted with a hydrophone, and has likely picked up foraging clicks of beaked whales. University of Washington scientists did the glider’s engineering, while Oregon State researchers developed software to identify what is being heard. “We believe we have identified beaked whales,” says OSU’s David Mellinger. “It was pretty exciting. You work a couple of years on a project, hope it will succeed, but you don’t know until the equipment is wet.” The current glider deployment, which began on October 27, is scheduled to end on November 17. Here at AEI, we take special pride in this research, since Mellinger is one of our founding board members! Read more about this study at Nature News, and see real-time records from the glider itself at the bottom of this page at UW (check this map to see all currently deployed gliders, though the others are not doing acoustics research). You can also read more about UW’s glider research at their Applied Physics Lab website, and see this presentation on acoustic glider research from a different research team. Thanks to Brandon Southall’s blog on his new SEA-inc website, which is fast becoming one of the best places to stay abreast of key ocean acoustics research, I heard today the details of what’s planned at the upcoming Minerals Management Service three-day workshop on Acoustic Mitigation and Monitoring Systems for Marine Mammals. The workshop website now has the agenda online, and will include links to conference documents. I was surprised and delighted to see that my most recent annual ocean noise report is first on the list of Background Documents to be read by attendees! This report, Ocean Noise 2008: Science, Policy, Legal Developments, can be downloaded from the conference site; it is also available, along with its brethren from 2006 and 2007, at AEI’s page on DocStock.com. Several of my conference Powerpoint presentations are also now available for viewing and download as well, at AEI’s SlideShare page. The three-day workshop takes place in Boston later this month, and is bringing together most of the key players in the field, including Southall, Cornell’s Chris Clark, Oregon State’s Dave Mellinger, Aaron Thode of Scripps, Leila Hatch of Stellwagen Bank, passive device designers Peter Stein and Gordon Hastie, and several key oil and gas industry players, including Bill Streever (check out his great new book on the north, entitled Cold), David Hedgeland, and Bernard Padovani. The promise of deep offshore wind energy is moving forward rapidly in the wake of the world’s first floating wind turbine, deployed off Norway in September by StatoilHydro. The Gulf of Maine is in line to see similar turbines in coming years, thanks to a focused effort by the National Renewable Energy Lab and regional energy planners. In Massachusetts, plans are progressing for a test deployment of a floating turbine not far from the embattled near-shore Cape Wind site, while in Maine, a public comment period is underway prior to selecting test sites for floating offshore turbines. This Powerpoint presentation (here in pdf format) from a NREL researcher provides a good overview of the current plans in Maine. 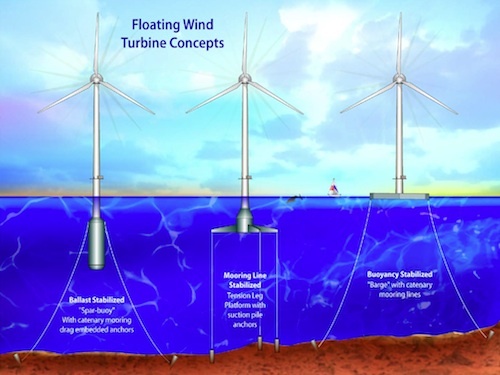 These deep offshore designs promise to avoid the troublesome noise impacts that have become common with onshore wind farms within a half mile or mile of homes, as well as both visual and noise concerns with near-shore wind farms. According to EENews (subscription required), energy planners in Maine made the choice to push the new deepwater technology, rather than facing the political hurdles of near-shore wind: “We made the decision at the outset to solve engineering questions and not legal ones,” Habib Dagher said, alluding to legal and political problems faced by Cape Wind. The first deepwater turbines are slated to hit the water by April 2011 in a yet-to-be-determined location in the Gulf of Maine and at a site in the Isle of Shoals. The initial project sites will be 3 nautical miles offshore for ease of access, but commercial models would be 20 miles or more from shore, Dagher said. EENews, cont’d: The DOE recently awarded the University of Maine $8 million to develop three deepwater offshore floating wind turbines. With $5 million coming from the Energy and Water Appropriations bill and additional state and private funds, the project is expected to have a budget of about $20 million. More than 30 research and industry partners will be tackling the deepwater initiative. The key to the success of the models — ranging in power from 10 to 100 kilowatts — is engineering that keeps the turbines buoyant and lets waves sway them without rocking them from their moorings. One model will be similar to StatoilHydro’s, and the company will be pitching in to assist with the work. “It’s like taking Windows 2.0 and giving it a major upgrade,” explained Habib Dagher, director of the Advanced Structures and Composites Center at the University of Maine, who will be heading up all three projects. Dagher plans to use lighter composite materials than the original Norwegian steel-based model and to make the structure larger. UPDATE: 12/15 The State of Maine has chosen three sites off its coast, where scale models of several different floating turbine designs will be tested beginning in 2011. And, here’s a link to a quick overview of future-looking developments in offshore wind discussed at the recent European Offshore Wind conference in Stockholm. UPDATE, 5/30/12: The Maine scale model test has been put off by one year, to 2013, by permitting delays. The Institution of Engineering and Technology magazine has published a very good overview of wind turbine noise issues. The article includes summaries and criticisms of many of the leading researchers on both sides of the issue, including the ongoing (and soon to ramp up) controversies surrounding Nina Pierpont’s “Wind Turbine Syndrome.” Of special note are comments from Geoff Leventhall, a longtime low-frequency noise researcher who has often criticized Pierpont: “The wind developers are going to rubbish her book, and quite rightly so, but what must be accepted – and developers don’t want to accept this – is that yes, people are disturbed,” he says. “If people are consistently disturbed, and their sleep is consistently disturbed, then they will develop some very ‘unclever’ stress symptoms. That will lead to stress-related illness.” Read the whole article here. This one just popped up, though it’s from last spring: a seemingly quite comprehensive survey of people living within a half-mile of one of the major wind farms in Wisconsin that has triggered noise concerns. The results reinforce the emerging picture: many people are being affected, but negative impacts are not inevitable or universal. Of those within 3000 feet, 56% (90) were bothered by noise, while 44% (72) were not; beyond 3000 feet, 3 of 10 families reported noise issues; among those who did not specify a distance, 15 were troubled, and 19 were not. Of 23 respondents who had leased land for turbines, 9 (39%) noted that noise was a problem for them, and 6 (26%) said they would not so, if they knew then what they know now. 33% reported various stress-related health issues, while two-thirds did not. 62% said the setbacks should be a half mile or more; 22% supported the current 1000 foot setback. Once again, we are left with the murky social question: what proportion of the population is it OK to bother? Should we move turbines further away (thus sacrificing some sites) in order to reduce impacts on the scale we see here? Or, with a healthy majority of people reporting no negative health impacts, is it fine to proceed as we have been? I suspect that the answer to these questions is equally clear to some on each side of the issue, while many others likely struggle to find a balance that makes sense. See this recent AEInews post summarizing three recent scientific papers on annoyance and health impacts from wind turbine noise, which lead to similarly murky conclusions.